Interview with @julianobelletti: "It's an honor to have been part of the history of FC Barcelona"
The Barça players celebrated wildly in the rain in Paris, and the outpouring of joy extended to Barcelona, in one of the greatest celebrations ever seen in Catalonia. It was the goal that secured Barça’s second Champions League and would immortalise forever the Brazilian defender. 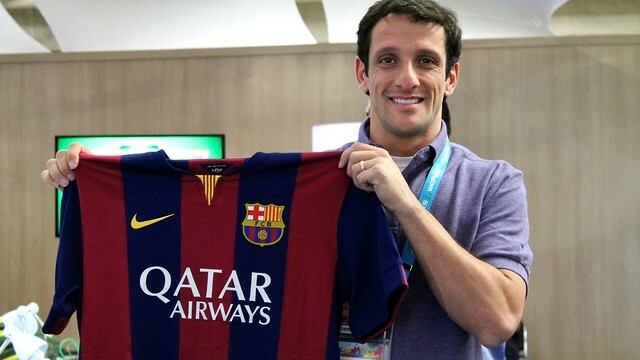 Juliano Haus Belletti (38) won two Spanish League titles, was the hero of the Champions League in Paris, and was part of the great team coached by Frank Rijkaard. All these achievements came after winning the World Cup with Brazil in 2002. From what we’ve seen so far, do you think that Brazil can win this World Cup? “I think so, but it won’t be easy. I expected them to suffer against Chile, as they are a great team, but I think that Brazil are getting better, and could well be Champions”. You are one of the fortunate players to win a World Cup. In your experience, what is the most important aspect to winning a competition like this? “You have to play intelligently, and be focused the whole time, but most important is to improve with very game, especially in a competition as balanced as we are seeing here in Brazil. This is paramount”. What did winning the title mean to you? Did it change your career or your personal life? “It’s a source of pride for family, friends, and everybody in general. It’s priceless. On a professional level it’s also very rewarding. There are great Brazilian players who have never won this title. Very few have won a World Cup and being part of that group fills me with great pride that will stay with me forever”. When you think about the World Cup, what is the first memory that comes to mind? “When I went onto the pitch during the semi-final against Turkey, in 2002. A game of this magnitude is never forgotten. I’m from Cascavel (Paraná) and to achieve something like that is very hard”. What do you miss most about your time at FC Barcelona? “Nothing specifically. As a professional, the major part of my career was spent at Barcelona, and everything was special. I can say that I am very proud of having played for this great club, and with such great players”. Why is Barça ‘More than a club’? “Because it wins trophies in all sporting disciplines. On the other hand, for the Club’s way of dealing with the families of the athletes, as it does with real care and in a special way, and also the special attention paid to the players themselves. Everything is done for you, and you only have to worry about playing. This is very important”. You played with Messi at the start of his career. Does it surprise you how well he’s done and his four Golden Balls won? “He was a special player, wanting to do something important. It was clear that he would be a great player, but nobody imagined that he would go so far. I must confess that I was surprised, because winning four ‘Golden Balls’, and maintaining that level for so many years is impressive. Nobody has done that before”. I don’t know if you are aware of what you signify for FC Barcelona. That goal in Paris, Barça’s second Champions League, made you immortal. What do you think about this? “I remember the fantastic celebrations, some of the largest ever seen in Catalonia, but I’m not really too aware of it, as I live in Brazil and in the end you lose a bit of contact. Anyway, the Club gave me a replica of the Champions League trophy, which I have in my house. It’s very rewarding, because it was a title really tough to win, probably tougher than the ones which came later”. What’s your take on the changes that Barça are undergoing? “What’s happening now is slightly different from our time. During that time, the problem was losing players. Now, age is the issue and, therefore, it’s an inevitable change. I don’t think that Barça has lost in quality, but the age of the players prevents them from maintaining the level shown in the past, and pressurising the opposition as they did before”. Do you think that Neymar will become an FC Barcelona idol? “I think the same is happening with him as it did with Messi. In our time, Messi had a fixed position on the pitch. With the arrival of Guardiola, he got more freedom and he became the player he is. I think that Neymar also needs to show his full potential. In the National Team he has total freedom and is the star. In Barça he may well become the same”. If you had to send a message to the Barça fans who always will remember you, what would it be? “When I was signed, I just wanted to give enjoyment to Barça and the fans. I never imagined that I would become part of the life of the Barça fans. Having achieved that is a great honor, and fills me with pride. I couldn’t ever ask for more”.